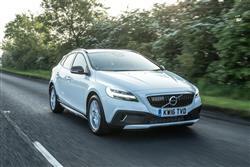 The improved Volvo V40 Cross Country model might just be the coolest looking hatch on sale in the UK. It's eye-catching, well engineered, well equipped and the prices aren't exorbitant either. There's just one downside; only the priciest petrol model is all-wheel drive. Still, with the introduction of clever, efficient, 'Drive-E' technology right across the range, there are now lots of reasons to justify ownership. Qashqai-style Crossovers now fill our roads, family hatchbacks with a touch of the Outback about them. But is it really necessary for a brand to design a product from scratch in order to compete in this growing market niche? 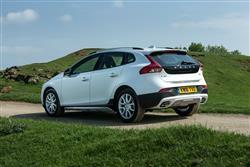 Volvo reckons not, bringing us this car, the improved V40 Cross Country. 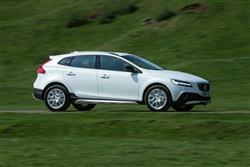 If the ordinary V40 didn't exist, you might see this as a very credible kind of compact crossover. As it is, we know that this is a V40 in a pair of hiking boots - though unlike some supposedly 'proper' Qashqai-class models, it does have the top-of-the-range option of 4WD. From Volvo's perspective, there's everything here that you need in a compact Qashqai-class Crossover - and nothing you don't. And the 'everything you need' bit includes class-leadingly efficient 2.0-litre petrol and diesel Drive-E engines. Let's put this Cross Country model to the test. First the bad news. 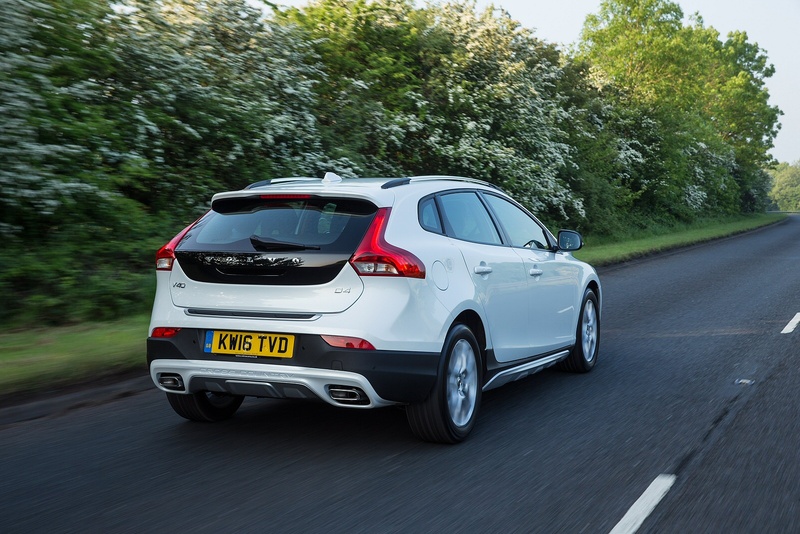 There's only one all-wheel drive model in the V40 Cross Country range and it's the top 245bhp T5 petrol model. This variant gets one of Volvo's clever 'Drive-E' range of modern era engines, but it's still going to be of minority interest to UK buyers. So where does that leave us with the rest of the range? With a bunch of front-wheel drive hatches. In other words, the 'Cross Country' bit is really only applicable if someone has considerately laid a few miles of tarmac across said country first. 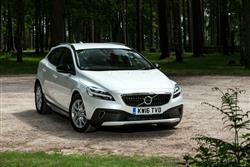 That also means that the V40 Cross Country isn't going to feel too far removed from a normal V40 to drive. Still, given that the standard V40 is brilliant, that's not much of a criticism. The ride height has been raised by 40mm to 173mm, which means that speed humps and non-dropped kerbs aren't such an issue. Volvo has also gamely fitted Hill Descent Control to the T5 AWD version, which controls the car's speed automatically when driving down steep inclines. The T5 also has a practical Hill Hold function that makes starting on a hill easier. This model really is the only one to really warrant the Cross Country branding and with a 254bhp engine to power it, the T5 has the power to really entertain. Even if you're not big on off-roading, it makes an awesome all-weather vehicle that will shrug off the worst of the British winter. It'll get to 62mph in around 6 seconds and directs 350Nm of torque through its automatic transmission. Of course, the car most people would want is a diesel with the all-wheel drive transmission but no luck there. The next best thing is Volvo's latest generation 'Drive-E' 2.0-litre diesel mated to 2WD, a unit developing 190bhp and an impressive combination of power and parsimony. Below this variant, there are two other 'Drive-E' 2WD diesel models on offer, starting with the 120bhp D2 and moving up to the 150bhp D3. There's also an older-tech T3 petrol unit. You might feel that most of the V40 Cross Country range has something of the phoney about it, but it's hard to argue with the fact that this car looks great. Jacking up a hatchback and adding a few bits of 'faux-by-four' body addenda isn't an approach that figures amongst the most ingenious product development plans but it's resulted in a car that, somewhat annoyingly, works really well from an aesthetic point of view. The V40 was always one of the very best-looking hatches for sale and the Cross Country takes that smooth, well-resolved shape and gives it a little more presence and attitude. Cross Country customers get silver roof rails, alloy wheels, a contrasting front bumper, honeycomb mesh grille and upright day-running lights, contrasting sills and a contrasting rear bumper with integrated skid plate. This latest version gets the re-styled front end recently added to more conventional V40 models, the smarter look including revised LED headlamps that feature the so-called 'Thor's Hammer' style that's already been seen in the brand's larger XC90, S90 and V90 series models. A smarter grille mesh completes the more confident stance. Some serious styling has gone into the V40's interior. The floating centre console houses a button-dense centre stack, and the eye is drawn to slick detailing such as the frameless rear view mirror and the translucent gear selector. It's not perfect. Some of the stalks feel a little cheap and headroom is a little pinched in the rear with narrow rear door apertures, but features such as the rubberised microswitch tailgate release, the full TFT graphic instrument panel and the deft piano black framed door mirrors keep the design balance well into credit. 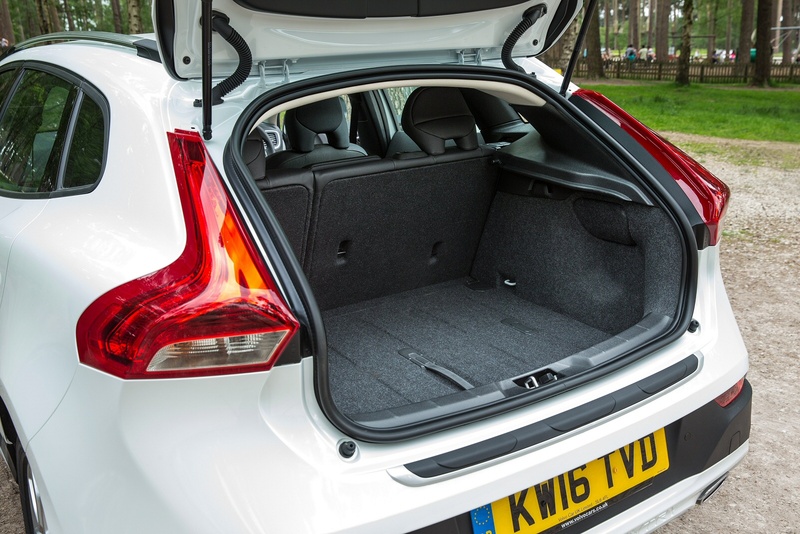 The boot is a decent size at 335-litres and features a hidden underfloor section to keep documents and valuables out of sight. You'll pay a £1,000 to get the 'Cross Country' package on a standard V40, which many potential buyers will be tempted by. 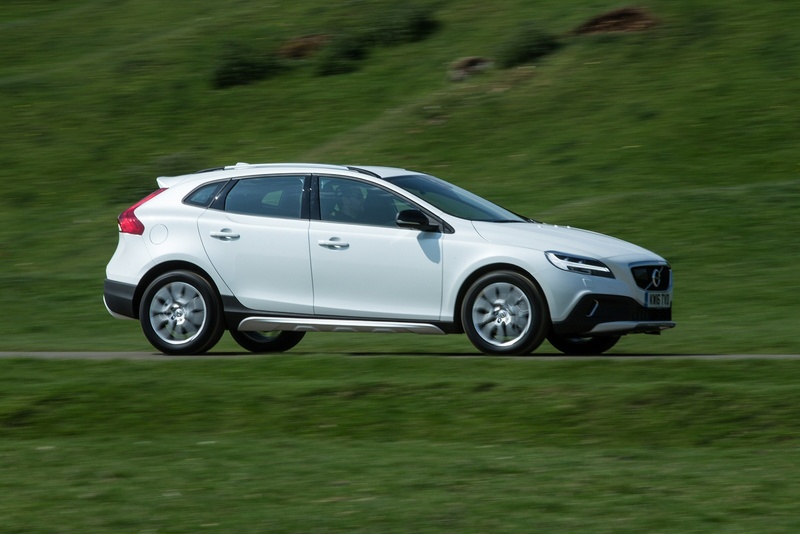 Overall, prospective V40 Cross Country buyers can expect to find a price span ranging from around £24,000 to around £34,000. Whatever version you choose, there's the option of paying a further £2,000 premium on top of the standard asking price and graduating up from standard 'SE' to 'LUX' trim. Even on the SE models though, you get plenty as standard - things like autofolding door mirrors with ground lights and black mirror covers, 16" alloy wheels, rain sensor, textile/T-Tec upholstery, tread plates and silver roof rails. At 'Cross Country Lux' level, you can also expect to find leather-faced upholstery, active bending xenon headlights, 17" alloy wheels, LED day-running lights, rear reading and theatre lighting. Across the range, there's class-leading safety, including the world's first pedestrian airbag, plus the award-winning Volvo City Safety system. This uses a laser to scan the road ahead for potential collision risks. If one's detected, the driver is warned. If no response is then forthcoming, the car can even brake itself. If you go further and specify the 'Pedestrian Detection with full auto brake' system, similar technology can even brake the car to avoid pedestrians. The Cross Country doesn't return quite as impressive fuel economy as the standard V40, but there's not too much in it. Take the D4 'Drive E' 2WD diesel version as an example. The stock V40 D4 records a combined fuel economy figure of 74.3mpg and the Cross Country model drops that marginally to 70.6mpg for a manual car, with 104g/km of CO2. Fitting an automatic gearbox hobbles the figure to 65.7mpg. But what of the 'proper' Cross Country, the 4WD 2.5-litre T5? That manages 149g/km of CO2, a figure unmatched by any potential rival. The 'Drive-E' D2 version is a star performer as far as economy and emissions are concerned, recording 96g/km and an average fuel figure of around 75mpg, both of which are absolutely brilliant for a relatively high-riding and sizeable vehicle. 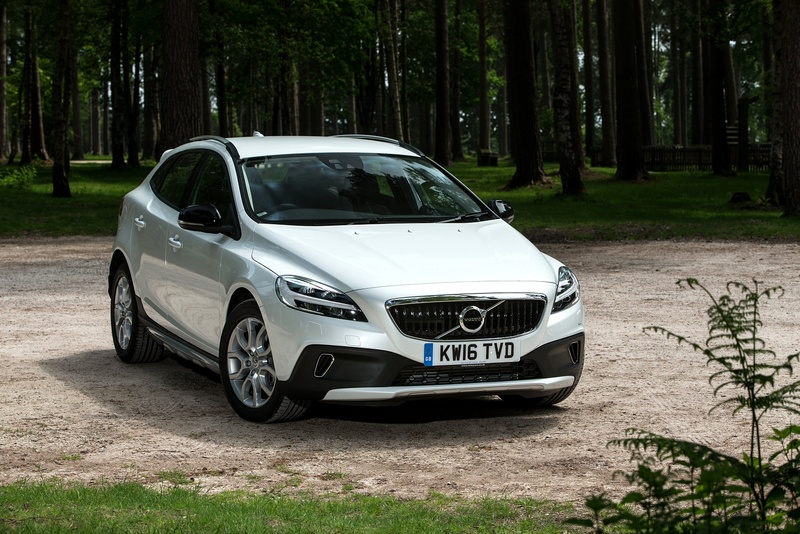 The public has taken to the V40 and as such, it commands excellent residual values, with the D3 diesel model of the Cross Country expected to be worth over 50 per cent of its original price after three years and 30,000 miles. If you�re looking for a new Volvo V40 T3  Cross Country 5dr Geartronic Petrol Hatchback for sale, you�ve come to the right place. At Bristol Street Motors we don�t just have the best Volvo V40 T3  Cross Country 5dr Geartronic Petrol Hatchback deals, we also offer friendly advice and help with all your enquiries to ensure your buying experience is a happy experience.